1. 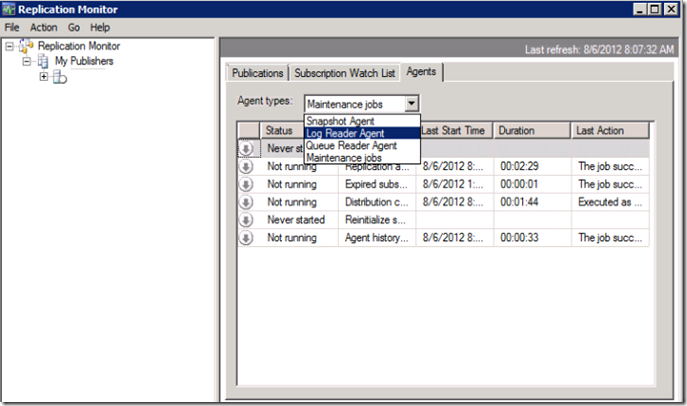 Go to Replication Monitor from Replication tab under default instance the option with right click. 2. Make sure all undistributed command processed and should be 0 for all subscriber. a. Go to snapshot agent option in combo box, right click and stop agent (to disable) or start agent (to enable) if it is running. b. Go to Log reader agent option in combo box, right click and stop agent (to disable) or start agent (to enable) if it is running. c. Go to Queue reader agent option in combo box, right click and stop agent (to disable) or start agent (to enable) if it is running. 4. Making database restricted and offline it. 5. Mapping database with new file location. 6. Stop SQL Database service and copy database files to new mapped location. 7. Making database online and make available with multi user. 8. Repeat step 3 with “Go to agent tab (to enable)” and finish this task. Please note these scripts run against publisher server. These are just steps and hope you found it useful. Thanks for reading.